THE MORE YOU PRAISE AND CELEBRATE YOUR LIFE, THE MORE THERE IS IN LIFE TO CELEBRATE. 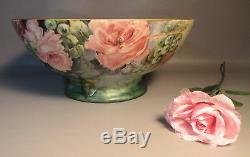 A splendid, spectacular Limoges T&V France marked Punch Bowl with Roses. Measures 6.75 high x 16 diameter. 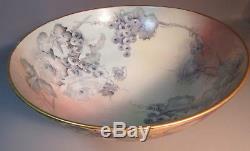 Note that most of the Limoges punch bowls are 13 in diameter. 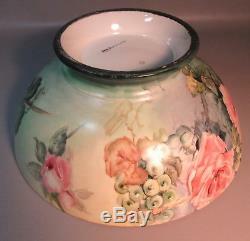 Hand painted inside with pale green, blue, pink, coral ground, grapes and roses in gray. 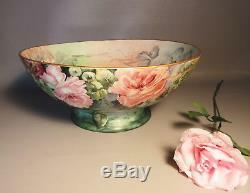 Outside, grapes & roses in pinks, greens, beige, blue, yellow, coral with gold rim. In mint condition, no chips, cracks, repairs, hairlines, use marks or crazing. In 1840 he opened an import house in New York. 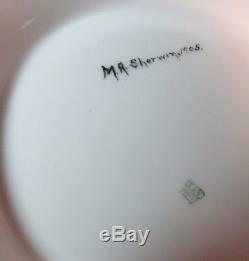 In the 1850s he opened an office in Limoges and soon began decorating porcelain in Limoges for export. His son Charles Vogt (d1886) and his nephew Frederic Dose (d1908) joined the New York company in 1865 and traded as Vogt & Dose, which also had a decorating studio in New York. Dose took over in 1886, succeed by Gustave Vogt whose son Charly managed the New York operations, which closed in 1931. In 1891 they bought two small porcelain factories in Faubourg Montjovis (Limoges) and made high quality whiteware for export to the USA. The company was commissioned in 1891 to produce a dinner service for President Harrison. Tressemann retired in 1907 and Gustave Vogt became sole owner and changed the name to Porcelaine Gustave Vogt. In 1919 Martial Reynaud bought the company and continued using the T&V mark as well as his own Reynaud mark. Reynaud porcelain remains in business today. Please note the following item specifics. OVERALL SIZE IN INCHES :16 dia. OVERALL CONDITION (SEE SCALE BELOW) : C9-Mint. CONDITION GRADING SCALE: C10-New, never used. C9-Mint C8-Near mint C7-Excellent C6-Very good C5-Good C4-Fair. PLEASE NOTE: Some monitors are adjusted to show a different color then the item may appear to be. We do our best to describe any flaws or repairs. We are not experts in every area. The antique and collectible items we sell are in the original estate condition with age appropriate imperfections. Some pieces will have normal use wear because of their age. We shall have no responsibility for any error or omission. Our items are fresh from local estates. Collecting is a way of linking past, present and future. Objects from the past get collected in the present to preserve them for the future. 19th CENTURY ANTIQUE COLLECTIBLES MAJOLICA STONEWARE EARTHENWARE FOLK FLOWBLUE VINTAGE HOME HOME DECOR DINNERWARE DECORATIVE ARTS KITCHEN & DINING FIGURINES DINING & SERVING DECORATIVE ARTS FAIENCE TIN GLAZED EARTHENWARE. 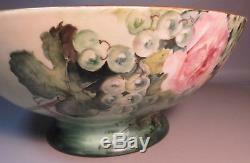 The item "1905 Limoges France T&V Hand Painted 16 Punch Bowl withGrapes & Roses Artist Sigd" is in sale since Wednesday, February 28, 2018. This item is in the category "Pottery & Glass\Pottery & China\China & Dinnerware\Limoges". The seller is "bgilliam" and is located in Barnstable, Massachusetts. This item can be shipped worldwide.